Technically I should win Worst Sister of the Year award with these, but I think I managed to redeem myself. My brother and his girlfriend got engaged in May this year, and moved house in September, and I only just gave them this, their engagement/new house present on Christmas Day. That's the bad sister bit. The good sister bit, was that I made the effort to hand print, and sew them their present, which they did at least get in the same calendar year. I don't think my brother reads my blog, but he does follow me on IG, and has a tendency to ask me to make him a version of whatever I've made from time to time. One of these days I'll call his bluff and make him dinosaur PJs, but in the meantime I made him cushions inspired by a sweatshirt and a dress. If you read my original sweatshirt post, you'll see that the inspiration for that was a cushion, so it's all got a bit meta. The stencil is the same as that used on my sweatshirt - not the exact one, I don't keep them, so I had to cut a new one - and the cross is that which I used to block print my Scout dress. They are both printed with black ink onto white soft furnishing fabric from Remnant Kings. It has a slight texture, which keeps it interesting, and it was really cheap at something like £7/m. I wanted some colour, and so used a turquoise cotton velvet from Edinburgh Fabrics (which was something ludicrous like £20/m) to back and pipe them. This is only the second time I've sewn piping and my first sewing velvet. It was OK, but I wouldn't rush to do it again. There are quite a few mistakes on these, the most noticeable being that I sewed the piping onto the back of the cushion, meaning the zip is now on the front. I put the zips to the bottom, and my brother will never notice, but that's one to remember. I also made the zip opening too small, so I did actually think I wasn't going to get the cushion pads in there for about 5 mins. That was fun. (It wasn't). Regardless though, I really like these. They look nice and contemporary, but also look unique and handmade (in a good way. I hope). I love the turquoise colour, and the velvet is gorgeously, strokeably tactile. I am seriously considering making velvet cushions for our house. Possibly not piped though. I don't yet have photos of the cushions in their new home. My brother and his girlfriend live in London, but were heading straight off to Turkey yesterday (she is Turkish) for New Year. So these photos are all taken in our house. 2016 Sewing Budget: August, September & October! With all the hecticness (hecticity?) of the past few months, I forgot about this monthly round up. For a good few years now, I've had a particular version of the Archer shirt in my head. I doubt I thought it up myself, but I can't remember where I saw it. This heron print fabric isn't it, but it's as close as I suspect I will ever get, so when I saw it on the IndieSew IG feed, I treated myself. As a general rule, I don't buy anything online from the US. Postage and customs charges are prohibitive, but this time I went for it, and the custom's gods were smiling because no charges! It's pretty summery though so I'm not sure how soon I'll be sewing this up. The pompom trim and thread was to finish off my pyjamas. Yes, I am that far behind! The crepe was a bit of an impulse purchase. I had a 20% discount code from the Splendid Stitch that expired at the beginning of Sept, so I thought I'd better use it! My plans are for another pair of Emerson Pants. I'm not 100% it will work, but I've already cut them out so I am committed. Finally, I have been lusting after the Hampshire trousers for a while, and have fabric earmarked in my stash, so I took advantage of an offer she had on. I have made a muslin of these already, but they are much looser and bigger than I anticipated, so they will need some work. I have parked them briefly to concentrate on something else, but I will go back to them. The pattern has a lot of promise and I desperately need some trousers for work. I promise that I will post some sewing soon. Really I will, but in the meantime, I thought I'd share some photos of our recent holiday to Santander. If you follow me on Instagram you've probably seen most of these already, and this will be a pretty photo heavy post. This was the first time we'd taken the boys abroad. The first time they'd been on a plane. So we thought we'd start fairly simple. My brother is actually getting married next year to his Turkish girlfriend, in Istanbul, so this was the test run so to speak. Closer to home, a much shorter flight, a language that I have at least a vague chance of being able to pronounce and relatively familiar currency. We flew Ryanair from Edinburgh direct to Santander and stayed in our first Airbnb, which was lovely. I realise I haven't taken many photos of it, so the link is here. It was really central, spacious and had a nice mix of period details and modernity. Santander itself is a nice city. It's on the North coast of Spain in Cantabria, not far from St Sebastian and Bilbao. It's a financial rather than touristy city, but it's pretty nonetheless and the beaches are gorgeous. It also has amazing play parks. The food was nice, but I don't feel that we probably had the best on offer. Trying to find places that catered for us all was tricky. I don't consider my kids to be overly fussy, but Baby Boy pretty much lived on bread, chorizo and ice cream for 4 days. The stuff I thought they would like - tortillas, croquettes, even the spanish ham and cheese - were pretty much rejected. They far preferred the cheap hamburguesas that our guidebook said to avoid. In lieu of another sewn thing to show you, I thought I'd share this. I actually don't know what to call it. Picture? Print? Wall hanging? Artwork? This is actually wrapping paper. I bought it from an independent homewares and gift shop in Edinburgh, called Homer. It cost me £2.50. Pretty expensive for wrapping paper, but I bought it with the idea to put it on the wall, as I loved the retro and nerdy look of the periodic table. It's actually been in the cupboard since about January, because I couldn't figure how out to display it. A frame was going to cost a fortune due to the size. I don't mind paying for a decent frame, but for a £2.50 piece of giftwrap?! Finally the answer came when in Anthropologie one day. 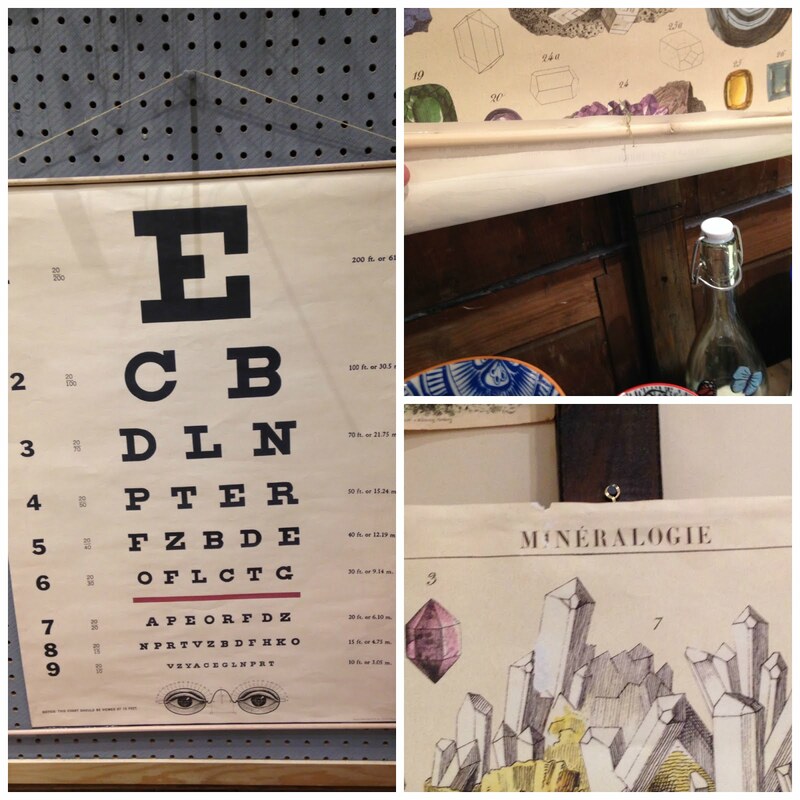 They had these display prints (below), which had a very similar feel to my periodic table. They weren't for sale, but the sales assistant let me take one down to have a look at how they were put together, and to take a couple of pictures. If I were a proper blogger, I would have taken pictures as I went along, and written a proper tutorial, but I haven't. Instead I can give a very brief description of what I did, which is all you need really. It took me about 15 mins to put together. Round dowelling - mine was about 6mm diameter. It cost a couple of quid from Homebase. Small hacksaw, or something to cut the dowelling with. 1. Measure the length of the top edge of the print. Decide how much of an overhang you want on either side - I did 3.5cm. Take the measurement of the edge of the print and add your 2 x your overhang measurement. e.g. print = 70cm + (3.5cm x 2) = 77cm. 2. Using your hacksaw, cut 2 lengths of the dowelling to the above measurement. So, I cut 2 lengths, each 77cm. Gently smooth any rough edges with the sandpaper. 3. Measure in 3.5cm (or your own overhang measurement) from each end of each piece of dowelling and mark with a pencil. This is so that you can easily centre your print on the dowelling. 4. Take the all purpose glue and run a very thin line along the top edge of the print. I did it on the back of the print, but you could do it on the front if you wanted the wood to show. 5. Using your pencil marks as a guide, quickly stick the dowelling onto the glue line. Apply pressure to the dowelling along its length to ensure it's properly stuck all the way along. 6. Leave to dry for a couple of minutes, then repeat steps 4 and 5 for the bottom of the print. 7. Leave for about 10 mins to ensure it's properly dry, then attach string to the top for hanging. Hi! Yes, I really am back again so soon! I have 2 days of sewing goodness to thank for that. On Sunday, a few of us met up for a chilled afternoon of sewing, chat, lunch and cake at The Stitchery in Glasgow. Sorry to everyone that we didn't invite - it wasn't meant as a cliquey get together or anything like that. It just started from an IG chat between Jen, Kathryn and I, which grew organically until we had 10 people, the max that The Stitchery could cater for. I probably don't need to explain this, but I didn't want anyone to think they had been deliberately excluded. There's nothing worse than that feeling! :( While it was great to catch up, the best part of the day was getting to finally meet Kathryn, a fellow Scot who lives in London, who has been a blog-and-Instagram friend for a few years now. Obviously she is lovely!!!! I also finally met Amy, another Instagram friend, but one who lives about 15 minutes away from me. Anyway, I got 5 hours of pretty much non-stop sewing, which gave me a good start on this pattern and I followed it immediately with a child-free day off work, which allowed me to get this finished off. Feast or famine over here, I tell you! The pattern is the True Bias Emerson Pants, and I really wish I'd made these at the beginning of the summer. I couldn't, of course, because she only released the pattern at the end of July, but I'd had a pretty clear idea all summer of making trousers like these. I had even bought the fabric - a medium weight chambray from The Sweet Mercerie. It's the same fabric I used in this dress. I liked the fabric so much, I bought more. I still have 1.5m left. I almost made these exactly as the pattern - a novelty for me these days, it seems. I would have done, but when I tried them on, I liked the length as it was. I did like it at the drafted length, but I preferrred them slightly longer, so I drafted another hem facing. 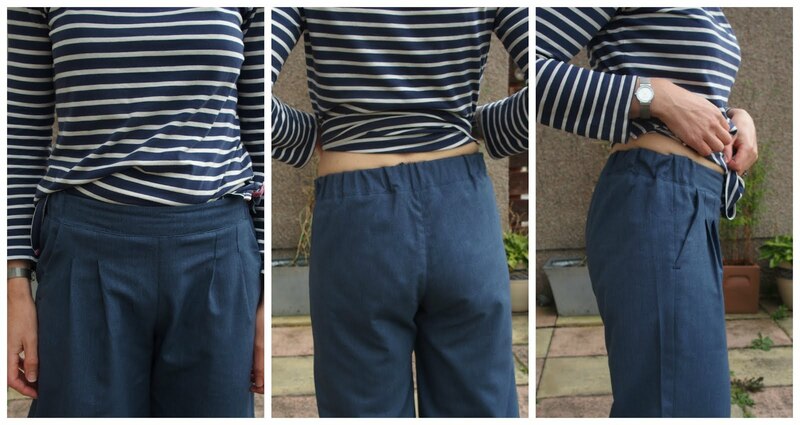 Trousers like these need a deep hem, I think, so I just made the hem facing the width of the instructed hem - 2 inches. Next time, I'll add 2 inches to the pattern length. My plan was to have contrasting top/edge stitching on these, and I even chose a kind of beigy gold thread. And then I forgot. Too much chatting. The fit isn't quite right. I always have issues with my calves in trousers. I thought with wide legs, this wouldn't be an issue, but you can see from some of the photos above that side seams don't hang perpendicular to the ground - they shift forwards. And in the photo with my back to the camera you can see something happening. Not sure if that's my thighs or my calves to be honest. If you have any ideas, feel free to chip in. It doesn't hugely bother me, but it would be nice to know how to fix it. So, yeah, the fit isn't perfect, but I don't really care! I love them and I have already cut out a second pair.